I was trying to do a classification task using muse headband. I wanted to know what kind of information is captured in the raw eeg signals. Can they be used to distinguish between objects the person is thinking about? Also can muse headband provide info about eye movement? 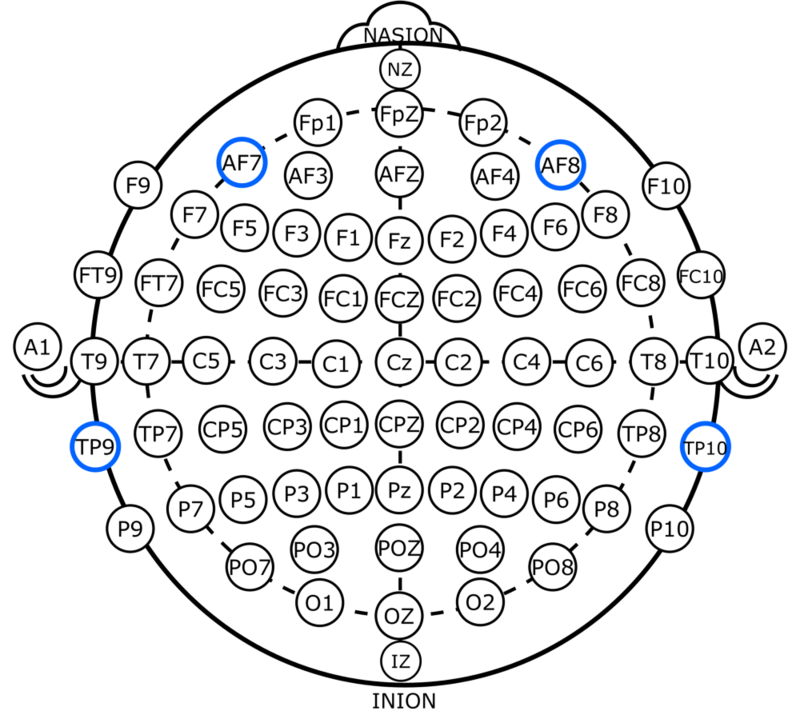 TP9, TP10, AF7 and AF8 are EEG scalp nodes. They’re more of “markers” on a map of the scalp rather than having a specific purpose. Check out this diagram for reference. The thing to remember with EEG is that we can never know what a person is thinking about. That is, we can measure thoughts temporally (i.e. when they happen, due to electrochemical signals between neurons), but we can never know their content. A nice analogy I’ve come across is that of a football stadium. You can never hear individual conversations of the people inside the stadium, but you’ll definitely know when a goal is scored with all the shouts and activity going on inside. The same is with EEG. EEG will only tell you when a thought occurs, but not what it is. With objects, there are small, localized areas in the brain that deal with object recognition. Face recognition, for example, gets its own area in the brain (the fusiform face area). These areas are deep within the brain and cannot be picked up with EEG, especially the Muse which has its electrodes on the front and sides of the head (object recognition is more towards the posterior side of the brain). At best, these detections can be picked up with fMRI. Lastly, no, EEG will not tell you anything about eye movements. At most, it will tell you something about blinking, because the muscle activity above the eyes generates electricity that is picked up by the Muse, and that noise is quite loud in signal processing (much like jaw clenching). Hope that helped and cleared things up. Anyone is free to let me know if I got something wrong.